A tweet of mine got picked by non affiliated to Twitter, Pick of the Twitter. Should I be excited? Or does this mean you just have mention a tech personality, iTunes and the latest Josh Wedon project to get indexed? What you haven't hear of Joss Wedon's latest project? For shame! 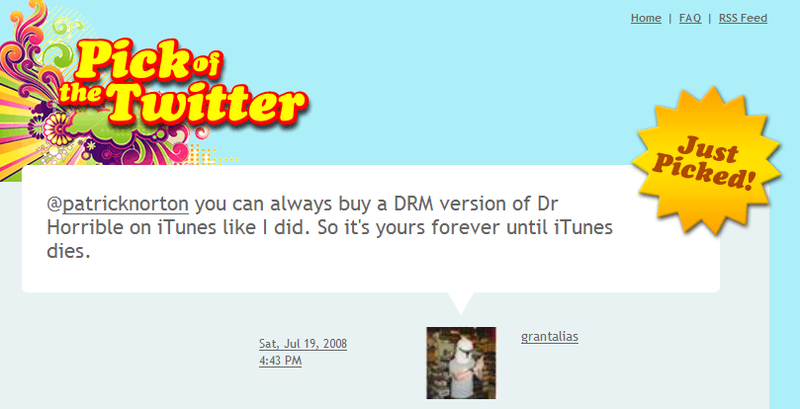 It's called Dr. Horrible's Sing-Along-Blog. It stars Neil Patrick Harris (who's awesome! ), Nathan Fillion & Felicia Day. It's a super funny musical take on the super hero genera. Catch it free while you can online. If you miss it, you might try getting it on iTunes for a few dollars if you can't wait for the odvious DVD release. Check out the mini comic on Dark Horse's MySpace page of Captain Hammer or buy some t-shirts over on Jinx. I so hope we are going to see some more of these mini episodes from Joss Wedon in the future! 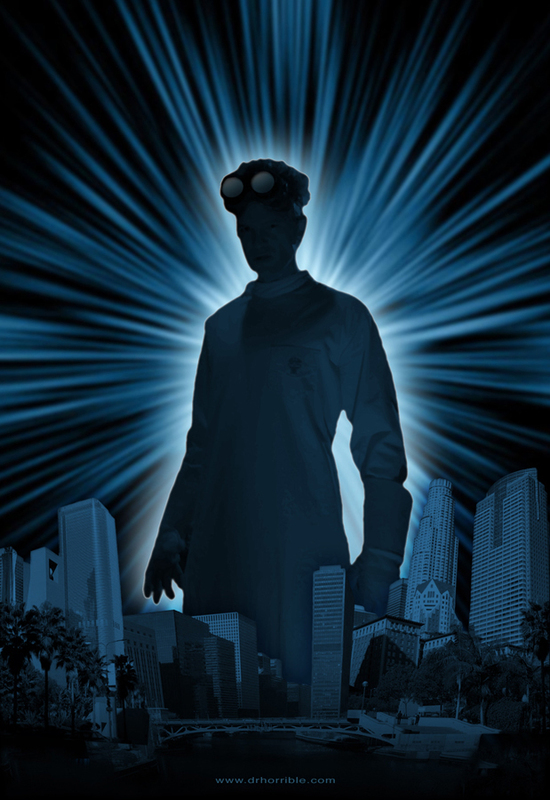 I really commend Wedon on trying out a new format and distribution model for Dr. Horrible. Hopefully this will show the big studios and networks that you can make money by giving away your media. 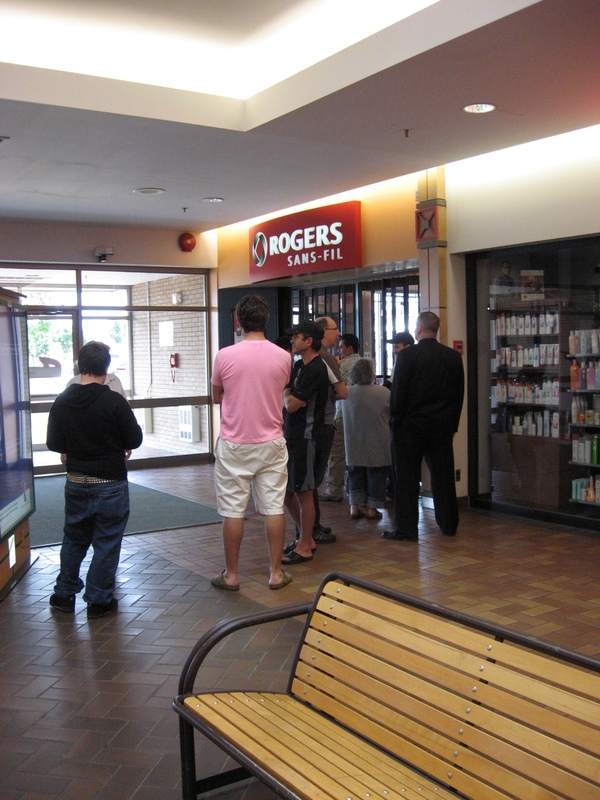 8:55am I swung by the local Rogers store to see what was going on. There was about 10 people in the line. One looked like a senior citizen and a kid of at most 10 years old and they both looked like they were with family. Inside the store I could see they had an iPhone on display and the workers were quite the busy bees getting ready for the opening of the store. Now I'm just waiting for the 2.0 firmware software. Unfortunately it looks like the iTunes store is coming back with an error message. Having recently purchased my first songs from iTunes (DRM free) I was very excited about the whole thing. That is until a friend asked "why do you buy your songs?". The question made me think and here's the main reason I came up with. Buying an item emotionally invests you in it. You'll look after, cherish and protect it. Of course I should also point out the major selling that has stopped me from purchasing music online up to now has been DRM. iTunes Plus will do for now but I'm really waiting for the Amazon MP3 store to come to Canada. There are two main drawbacks to me for buying music. One, I'm completely out of the loop when it comes to "what the kids are listing too" and two, my disposable income can be better spent elsewhere. So here's my solution, download legally free music. You might have to do some leg work to get them but no more than you would do running Limewire or Bittorrent. Believe it or not my knee jerk first choice here is iTunes. I've mentioned this to people and very few are even aware that iTunes has a free single of the week. Ok, it's DRMed, and only works on an iPod, but it's free and if you don't like it delete. That will get you 52 free songs a year. In the past year I even scored a free audio book! 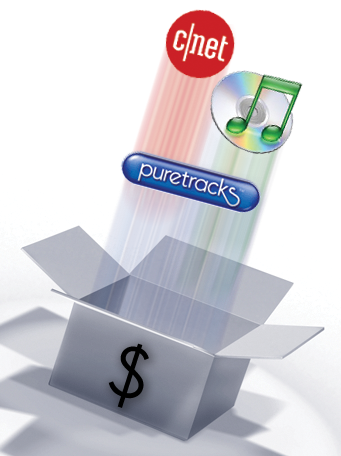 Your second choice is Puretracks. They have a free MP3 of the week also but unlike iTunes it's an unDRMed MP3 encoded at 192kbps versus a 128kbps AAC file. That's another 52 free songs a year for you. The mother load for free music is download.com. They have a free song a day, no DRM and encoded at 192kbps. There are over 111,000 free songs on their site and you don't have to be a member or be located in the USA for get them. A plus for me. So there's an additional 111,000 songs for you (coincidentally, that's 37 times more songs than my current music collection). Of course this is just scratching the surface when it comes to free legitimate music. Many independent artists and labels have free songs. Armed with time and Google I'm sure you could certainly find more, who knows you might already know of some. And if you do why not let me know. Thanks. I can't think of a better serendipitous way to discover new music. With so much free music out there it not only makes me wonder why people download music illegally but why anyone pays for it either. UPDATE: Dan of we love music passed along another site that offers free downloads. It's been a little over a month now since I've had my iPod Touch and I'm still loving it. Not only does it get me into the exclusive and usually cost prohibitive (MacBook Air cough cough) Mac fan boy club but now I have a reason to listen to MacBreak Weekly without looking like a poser. Here's a run down on my favorite things for the Touch. Mobile Internet. Sure I can only use it on wi-fi but I'm usually home anyway and it keeps me from disappearing in to the computer dungeon. Web Apps. Again internet connectivity is a must for this one. Some of my favorites are the Thincloud Twitter app that does a better job at the mobile interface than Twitter's own in my opinion. The Facebook web app which looks so much better on my home screen now with it's own icon. TV Forcast not only tells me when the next new episode is airing but also offers a short synopsis and links to Tv.com for full show information. And a new one I started using called Flytunes. It lets you listen music on your Touch (I know sounds redundant but it's pretty nice). There's doznes of themed music channels to listen to and it works pretty good on my old B Wi-Fi router. iTunes. The only music I've even bought off iTunes has been with the Touch. The interface is of course perfectly thought out and it's so simple I have to be careful or I'll max out my credit card (not no really but it easy to buy music). The January Software Update. IMAP mail and Google maps alone is worth the $20 I spent on it. And emailing Notes is pretty useful to moblog on VOX. Twins video to iPod-Zune-PSP-3GP. 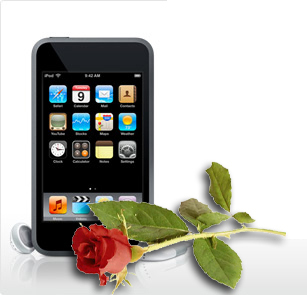 This program convert your other miscellaneous video for the iPod. Its great software, simple to use and most importantly free. The video I've converted looks great on the Touch. But with any relationship there are always a few things that drive you crazy. Saving trips in Maps. If you foolishly leave the trip map it's gone and out on the road there's no way to get the turn by turn directions back. Also can I just download all the street level maps for my province also? Please? Podcasts in iTunes. Downloading podcasts when you are out and about would complete iTunes on the Touch for me. Mail using my gmail address book. It's really annoying to have IMAP email on your Touch and it only grabs the contact list that is stored locally on the Touch. Organizing Videos. Dividing videos into Videos, Music and Podcast (on the same screen) just doesn't cut it for me. Having dozens of videos without even a basic search feature let alone a folder structure can be maddening. Flash in Safari. Even the Wii can play embedded flash videos and it costs less than my iPod did. Oh and it also has games Steve. But even these few reasons can't stop me from loving my iPod Touch. I jokingly said with being out the loop the this last week, "oh watch the iPhone get released or something". 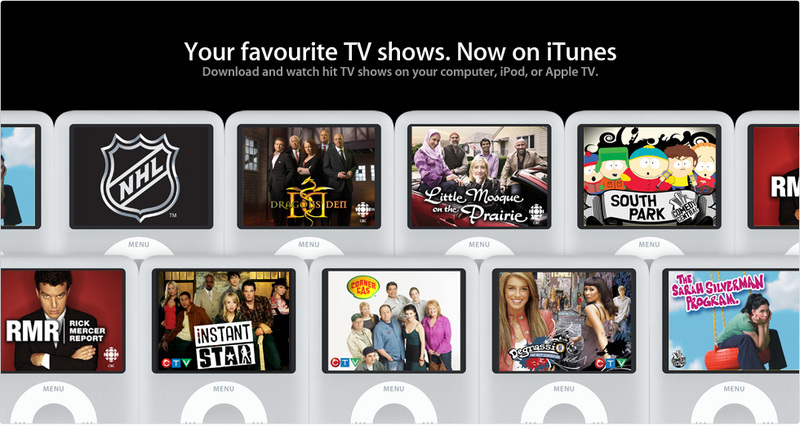 Well it wasn't the iPhone, but now we (Canadians) can spend too much on television just like our neighbors to the south. 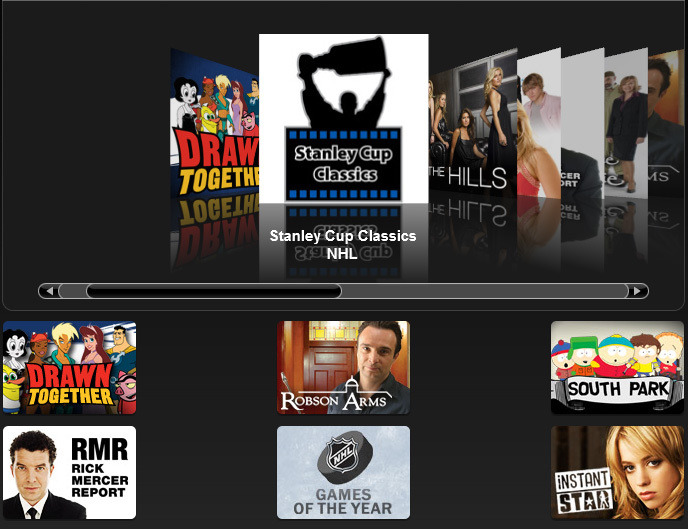 Of course this being Canada you can buy Hockey on iTunes. I just would have thought that they would have nice cover art for the Stanley Cup Classics. It looks very 1996 I think. Well they're here. 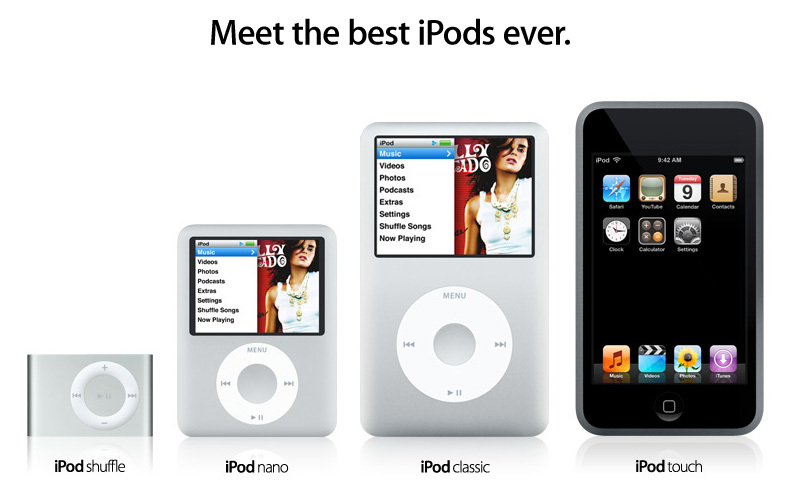 The much rumored iPods were unveiled today during an Apple event by our good friend Steve. I followed the live feeds from ARS Technica and Engadget and it was nice they were both sitting on opposite sides of the hall so that their photos were from different angles. It was appreciated. Thanks guys. 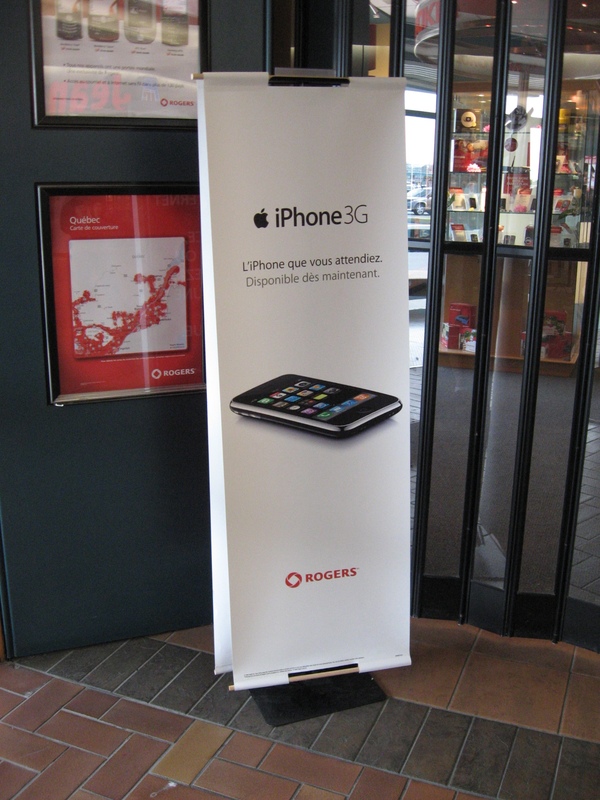 I really like the Nano price point at $169 (that's Canadian) for the 4GB model. If the Nano was out a year ago I would have totally bought the Nano. But now with the release of the Touch I don't know what to think. Of course the $329 price tag for the 8GB and $449 for the 16GB one put the breaks on me pre-ordering it. Sure it's innovative to buy tracks over wi-fi and surf the net, it's just too bad you can't squirt songs. So you can get songs at Starbucks and surf for free and that's really cool too. Except I don't drink coffee and there are only two Starbucks that I know of in my town. On the other hand maybe this could be proof that my three year old son has psychic powers and had predicted this union by telling me he wants us to stop everyday at Starbucks for the past month when we past it on the way home from his daycare. And the recent addition of iTunes Plus and the lack of the dreaded DRM, the iPod is starting to look very attractive. There's a pretty thorough walk through on the Apple site of what the new iTouch… I mean iPod Touch can do. Oh come on, you know everyone is going to be calling it that. Now where the hell is my full Beatles catalog? 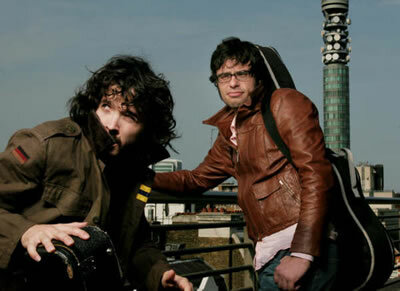 On iTunes Canada the free single of the week is a Flight of the Conchords song. I've only caught the end of one episode but it looks funny. Reminds me a bit of Tenacious D, not the music style but the comedic band thing. So get you iBut to iTunes and get a free, DRMed song. Because we all know we're never going to buy anything from iTunes. But if you have, pray to what ever deity you worship that they never break you music like Google Video did to their video downloads. My fav band Sloan has a video podcast on iTunes that documents their latest release Never Hear the End of it. And it leads up to the South by South West Music festival that they will be performing at. Here's some of their more stylish videos. As I mentioned earlier about Steve getting my iTunes cash, it seems he's falling on hard times, or would that be ihard times. Sales at the iTunes has dropped quite a bit in 2006 acording to USA Today.